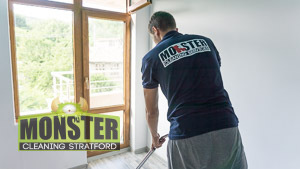 Although Monster Cleaning Stratford was established a few years ago, it has managed to quickly become one of the most reputable and professional cleaning companies in the area. We have a stable and constantly growing client base that appreciates our dedication and high quality services. Our services were developed with our clients in mind. The experienced and trusted experts in the industry made sure of that. For us, no job is too small or too big. We are available for anything from oven and sofa cleaning to end of tenancy and full house cleaning jobs. Domestic, business and commercial clients can all take advantage of these benefits. If you become a regular customer of ours, you will have the opportunity to save even more on cleaning. We prefer to use green and organic supplies, because we don’t want to expose your family, friends, coworkers or pets to any harsh chemicals or health-threatening products. To make things easier for our customers, we have a flexible working schedule and can be hired at any time of the day. We even take on cleaning projects on weekends and on business holidays.